A friend of mine is moving away, and I wanted to make her a little something to say goodbye. She is the famous baker in our circle of friends- known especially for her chocolate peanut butter krispy treats and caramelitas. 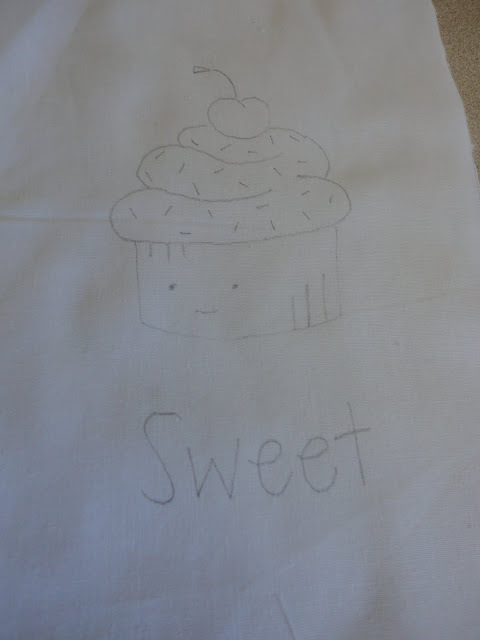 So I found this adorable free cupcake pattern online from DMC Threads. Start by gathering your materials together. 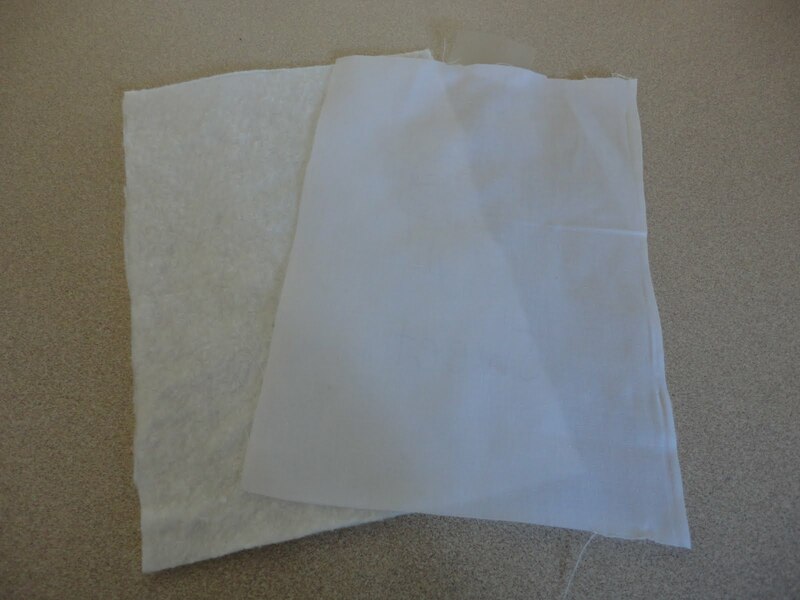 Cut your fabric to fit your frame, plus about a 1/2 inch extra around so you can pull the finished stitchery nice and tight. Print out your patterns. 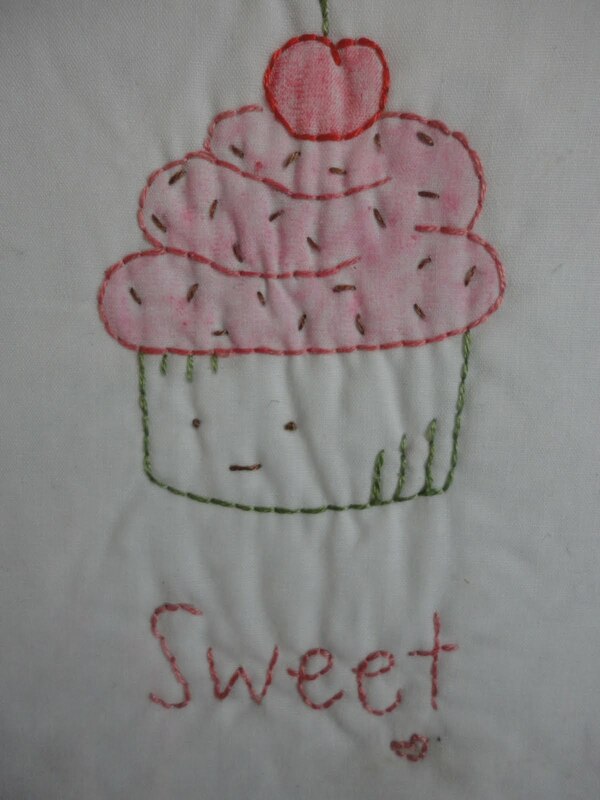 I added the word "Sweet" in a cute font to my picture. To trace, tape your pattern to a window, or, if you have one, a light box. Place your muslin over the pattern where you want it to be. 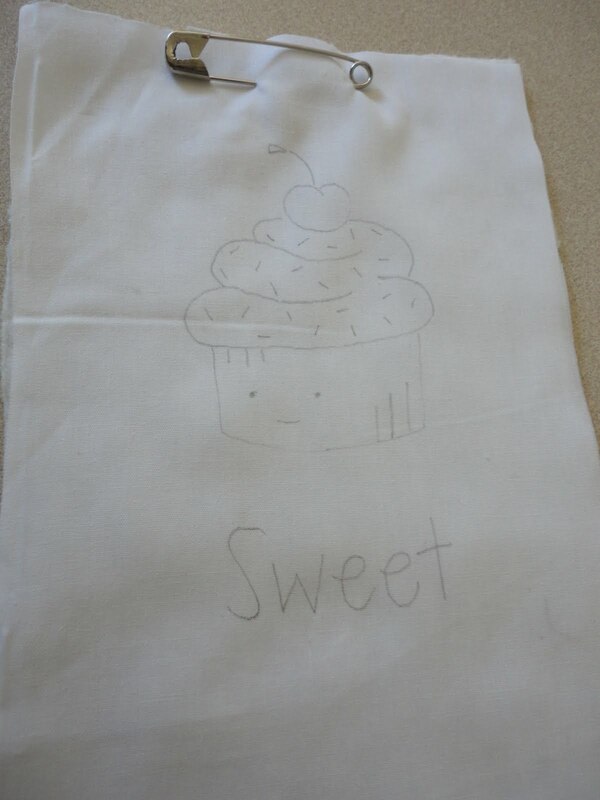 Use a pencil to lightly trace the pattern onto your muslin. If you want to color in any part of your design, do so with crayons now. When the colors are the way you want, set them by placing a press cloth over the colored design, and applying a hot iron for several seconds to set the crayon. I actually did this later (see below) but right here is the preferred time to do so. I didn't have a small embroidery hoop, so I safety-pinned my muslin to my batting. You just want it to be fairly taut and stable as you stitch. 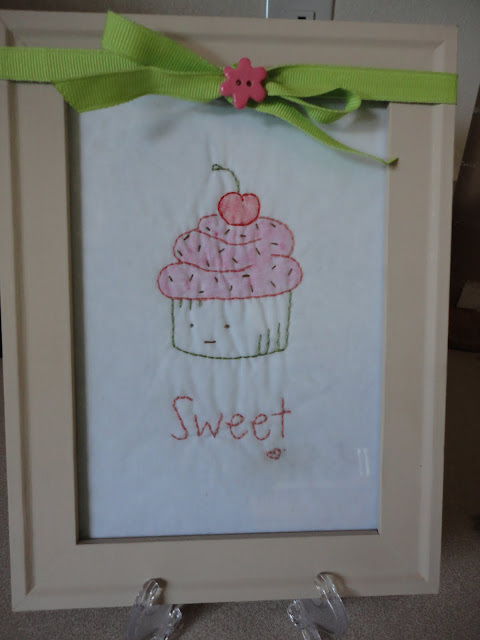 Using a backstitch, outline the pattern in embroidery floss with the colors of your own choosing. The eyes in mine are french knots. 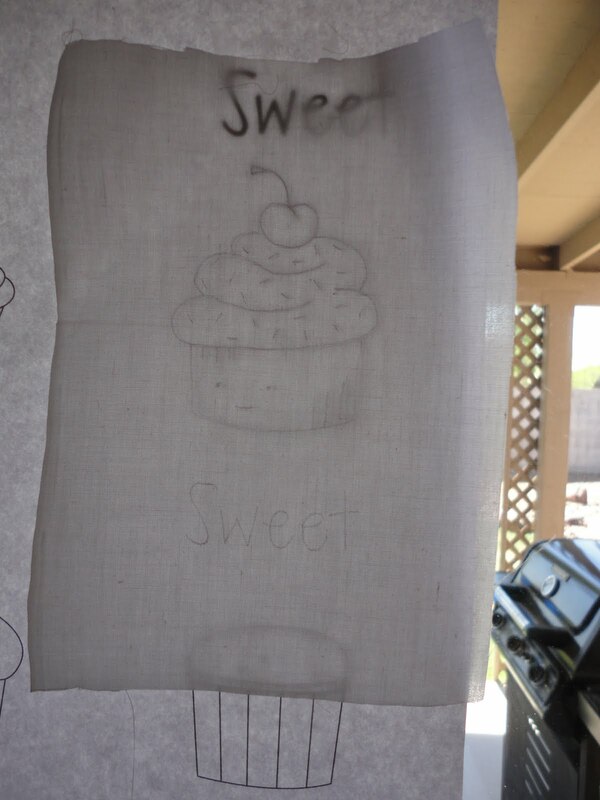 I decided, when it was done, that it needed a little something more, so I colored my frosting and cherry with crayons. The color isn't perfectly even because of the sprinkles, though, so I definitely should have done it earlier. I still like it though. 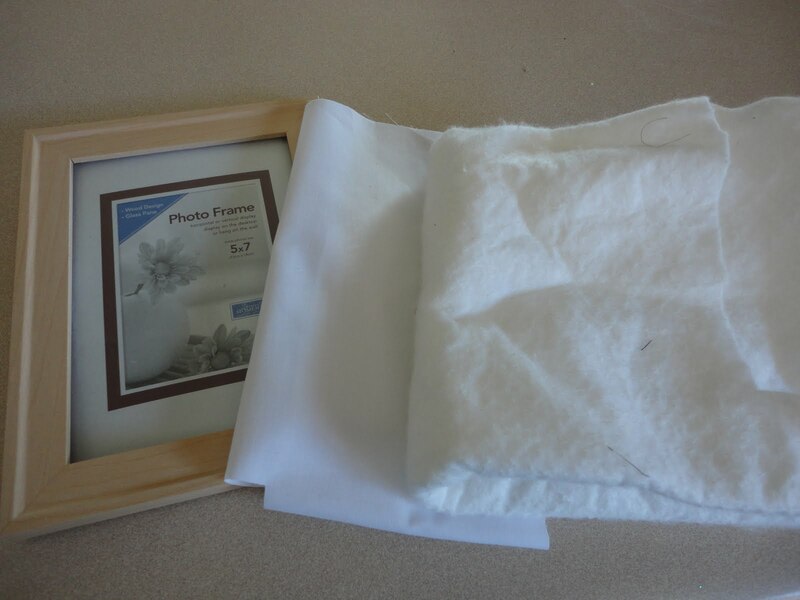 Place the completed stitchery in a frame and finish the back of your frame. I was using a dollar store frame that I had painted, so I just replaced the original back. If you are using a stitchery frame, you can cover it the back with craft paper and glue or staple in place. Add some hanging hardware and you're good to go! 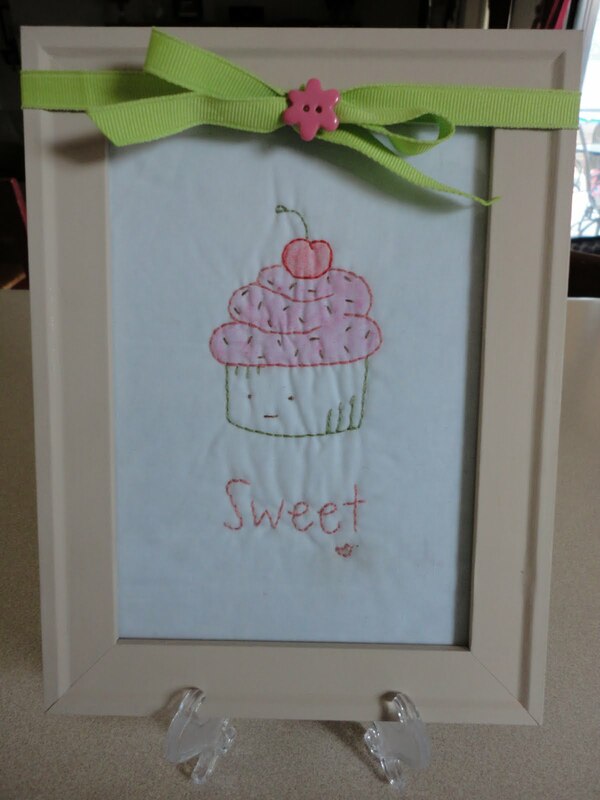 I added a ribbon for a little extra sweetness, and it was ready to be given away. But it's so sweet I might just have to make one for myself! Linking up to some of these parties- go join the fun! Cute! I've wanted to do something like this! SO CUTE!! I'd love for you to link up! !